On October 23, 2018, President Trump signed into law the America’s Water Infrastructure Act of 2018 (AWIA), S. 3021, a comprehensive water resources bill that includes provisions specifically targeted to promote new hydropower development. The AWIA includes a package of hydropower bills that were previously approved by the U.S. House or Senate. These include bills to promote new hydropower development at non-powered dams, new closed-loop pumped storage hydropower, new hydropower at qualifying conduit facilities, as well as longer preliminary permit terms and start of construction deadlines for new projects. The legislation also provides incentives for redevelopment and modernization at existing projects during the license term. Each individual bill that comprises the AWIA has been pending before Congress in one form or another for several years. Certain of these provisions were included in the comprehensive energy bill that failed to pass at the end of 2016. Since then, the bills have each been individually reintroduced before Congress and followed individual tracks. They were only recently combined into the AWIA bill. The bill passed the Senate by unanimous consent on September 4, 2018. It passed the House by a vote of 99-1 on October 10, 2018, with Congressman Mike Lee of Utah as the sole dissenting vote. The AWIA is composed of five major categories of hydropower reform: (1) extending preliminary permit terms and start of construction deadlines for new construction projects; (2) promoting new, small conduit hydropower facilities; (3) promoting hydropower development at existing nonpowered dams; (4) promoting development of closed-loop pumped storage projects; and (5) incentivizing investments and modernization projects at existing hydropower facilities. First, the AWIA amends the Federal Power Act (FPA) to authorize the Federal Energy Regulatory Commission (FERC) to issue preliminary permits for up to four years, instead of the previous three-year limit. The legislation also authorizes FERC to extend a preliminary permit once for no more than four years, as opposed to the previous two years. This increases the total possible preliminary permit term from the current limit of five years to a possible eight years. The AWIA also codifies FERC’s current practice of issuing a new preliminary permit after the expiration of a permit under extraordinary circumstances. With regard to newly licensed projects, the AWIA authorizes FERC to extend the time a licensee has to commence construction under a license for up to eight years beyond the two years allotted under the license. Prior to enactment of the AWIA, FERC could extend the license once for no more than two years. This increases the total possible time to commence construction of a newly licensed project from four years to 10. These changes should facilitate developers’ ability to take projects from feasibility investigation to project completion without the recurring fear of expiring permits and frequent need for special legislation to extend license construction deadlines. The AWIA also amends FERC’s current policy on the collection of annual charges for new projects. Under current regulations, private licensees of unconstructed projects must begin paying annual charges on the date by which they are required to commence construction, or if that deadline is extended, no later than four years after the issuance date of the license (i.e., no later than four years after license issuance). The legislation changes this policy to provide that annual charges for unconstructed projects commence at the later of (1) the date by which the licensee is required to commence construction, or (2) the date of any extension of the construction commencement deadline. Because FERC is now authorized under the AWIA to extend the commence construction deadline for up to eight years, this provision of the legislation delays the start of annual charges up to 10 years after license issuance. These provisions of the AWIA do not distinguish between private licensees and state and municipal licensees, who under current regulations are not required to start paying annual charges until the commencement of project operations. However, the language appears to permit commencement of annual charges at a later date, allowing FERC to preserve its current regulations on the timing of annual charges paid by state and municipal licensees. Second, the AWIA directs FERC to issue a rule establishing an expedited process for licensing non-federal hydropower projects at certain existing nonpowered dams. In establishing this expedited process, the legislation requires FERC to convene an interagency task force with appropriate federal and state agencies and Indian tribes to establish licensing procedures that, to the extent practicable, ensure that such projects will not result in any material change to the storage, release, or flow operations of the nonpowered dam. This appears aimed at ensuring, if possible, that federal licensing will not result in impairment of dams for their existing nonpower purposes such as irrigation and water supply. Qualifying projects must not have been previously authorized for hydropower and must use for generation the withdrawals, diversions, releases, or flows from an existing dam, dike, embankment, or other barrier that is or was operated for the control, release, or distribution of water for agricultural, municipal, navigational, industrial, commercial, environmental, recreational, aesthetic, drinking water, or flood control purposes. Qualifying projects also must not propose to materially change the operations of the nonpowered dam. The expedited licensing process would result in an order not later than two years after receipt of a completed license application. The AWIA also directs FERC and the Secretaries of the Army, the Interior, and Agriculture, within 12 months, to develop a list of existing nonpowered federal dams with the greatest potential for non-federal hydropower development. The Secretary must provide the list to Congress and make it available to the public. Third, the AWIA directs FERC to issue a rule establishing an expedited process for licensing closed-loop pumped storage projects. Like the provisions for expedited licensing of projects at existing nonpowered dams, the legislation requires FERC to convene an interagency task force to coordinate the regulatory authorizations required to construct and operate closed-loop pumped storage projects. Although leaving to FERC to develop a definition for “closed-loop pumped storage,” qualifying pumped storage projects must cause little to no change to existing surface and groundwater flows and uses and be unlikely to adversely affect species listed as threatened or endangered under the Endangered Species Act. This would appear to narrow the class of qualifying projects considerably. An expedited licensing process would result in an order not later than two years after receipt of a completed license application. The AWIA also directs FERC to hold a workshop to explore potential opportunities for development of closed-loop pumped storage projects at abandoned mine sites and provide guidance to assist applicants for such projects. Fourth, the AWIA amends the FPA with respect to the criteria and process to qualify as a qualifying conduit hydropower facility. Under the 2013 Hydropower Regulatory Efficiency Act, certain hydropower facilities located on non-federally owned conduits with installed capacity of up to 5 megawatts (MW) are not required to be licensed or exempted by FERC. The AWIA increases the size limitation to 40 MW for such facilities. It also reduces the time for FERC to make a qualifying conduit determination decision from 45 to 30 days after an entity files a notice of intent to construct such a facility. Fifth, the AWIA directs FERC, when determining the term of a new license for an existing project, to give equal weight to project-related investments by the licensee under the existing license, including rehabilitation or replacement of major equipment, and investments proposed under the new license. This is a modification to FERC’s license term policy issued in 2017, which exempts all “maintenance measures” from consideration toward a new license term. The AWIA allows a licensee to seek a determination from FERC, within 60 days, on whether any planned, ongoing, or completed investment would be considered by FERC in determining a new license term. The hydropower provisions included in the AWIA bill are a meaningful first step in modernizing the hydropower licensing process. They are intended to generate renewed interest in new hydropower by allowing licensees more time and certainty to secure required approvals and financing for new projects, which was a challenging feat under current deadlines. While the majority of the provisions in the AWIA are intended to promote new hydropower development, Congress also sought to promote major modernization and rehabilitation projects at existing hydropower projects by ensuring that the investments in such projects are rewarded in the term of a new license. The AWIA does not include a number of other hydropower relicensing reforms that were included in the bipartisan Senate energy bill in 2016. These include provisions: (1) designating FERC as lead agency for coordinating federal authorizations from all agencies needed to develop a project; (2) authorizing FERC to refer agency disputes to the Council on Environmental Quality; (3) requiring resource agencies to give equal consideration to developmental and non-developmental values when imposing mandatory conditions or prescriptions; and (4) expanding the definition of renewable energy for federal programs to include all forms of hydropower. Unless these reforms are passed in the lame duck session, they must be reconsidered in the new 116th Congress beginning in 2019. 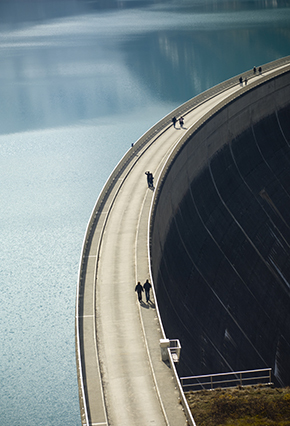 Van Ness Feldman’s hydroelectric and public land and natural resources practices provide comprehensive legal, policy, and business advisory services for the full range of issues affecting these matters. Van Ness Feldman’s decades of experience cover every aspect of these matters, ranging from transactions and land use planning to licensing, permitting, regulatory compliance and litigation. If you would like additional information on the AWIA bill, please contact any member of our hydroelectric practice.